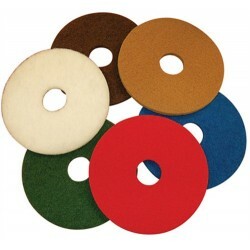 We stock a wide range of floor buffing pads. Floor pads come in 6 colours to signify how coarse the pad is, black is the most coarse and aggressive and white is the lightest. All synthetic fibre used to make these floor pads is from recycled materials.Floor pads wear evenl..
All synthetic fibre used to make these floor pads is from recycled materials. Floor pads wear eve..
All synthetic fibre used to make these floor pads is from recycled materials. Available in 8 " to..